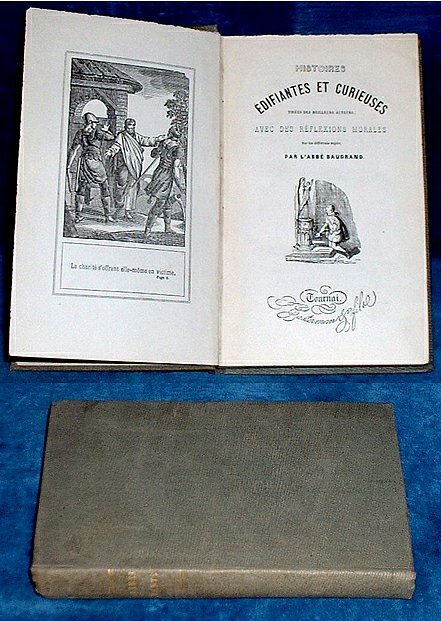 Title: HISTOIRES EDIFIANTES ET CURIEUSES tire´es des meilleurs auteurs; avec des re´flexions morales sur les diffe´rens sujets . .. Description: Tournai, France, J. Casterman & fils 1870 approx. Engraved plates (3) + vignette to titlepage + 2 tailpieces. . 175x105mm grey pebbled cloth gilt titleing direct to spine 312pp. Endpapers sl.dusty, name (Ellen Weld) to back of frontispiece otherwise clean with no loose pages, no markings.